I am not the first person writing on 10 (or a different number) of reasons why I am using Mozilla Firefox as my day-to-day web browser, and I am sure I won't be the last. However, this blog entry is not going to be some strong advocacy, trying to force Firefox on you, nor the ranting of a zealot. I just list the reasons of why I am using Firefox for my day-to-day browsing, somewhat in order of most used to less. I am still using Firefox 2 in case you're wondering why no Firefox 3 features are listed. Some of the reasons I list are not that strong today; other browsers support them as well. But it's the overall combination, and of course that I've been using Firefox since when it was still named Phoenix. While being free played some role back then, I left it off the list; I have no problem paying for good software I use daily. Also not on the list are security - even though it's a very important reason, following the W3C recommendations/drafts (often misnamed "the web standards"), being Open Source Software, render speed, or how well Firefox scores on the Acid tests. Because those are mostly under the hood items, and won't convince, for example, my mother to switch to Firefox. And, like I wrote in the beginning, this blog entry is not an advocacy. Since I use several operating systems, I love the fact that Firefox runs both on Windows and Linux (amongst others). I don't have to learn how to use a different browser, how easy that might be. More important, I can move my settings from one operating system to another without much trouble, and install the same add-ons on each. | My main editor for developing software is currently TextPad (however, I am slowly switching to Emacs). One feature I love about TextPad is the ability to have multiple source files open and switching between files using tabs, which are diplayed on top of the work area (or below, depending on a setting). Hence it was natural for me to fall in love with a browser that supports tabs to switch between web pages. Tabs don't clutter the desktop like opening new windows do. Also, it's easy to see all pages that are open and hide all by minimizing the main browser window. Mozilla Firefox with two tabs open. As a professional Perl programmer I use the command line interface (CLI) a lot. Meaning that instead of clicking with the mouse to achieve something, I type commands. Firefox allows me to do this as well; I can type commands in the location bar on top of the browser to visit sites, or to evoke a page with search results on Google. 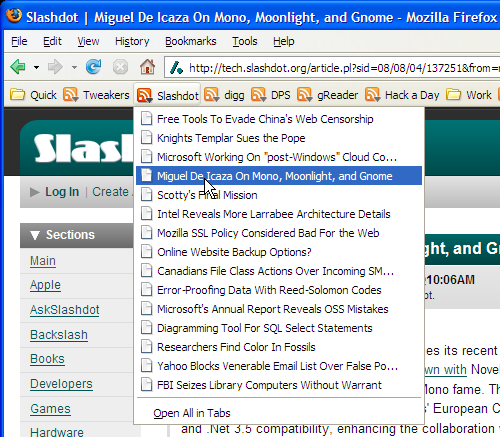 I like this feature so much that I've written a tutorial on it, see: Firefox bookmark keywords explained. In the past, when I wanted to follow a daily news site, like SlashDot, I had to visit the web site every day myself, for example by clicking on a bookmark, and skim for headlines. Live bookmarks provide a short cut to this if the web site has a web feed (for example using RSS or Atom). A Live bookmark fetches the web feed, and displays the headlines in a drop down menu. By clicking on a menu entry the web page is opened in Firefox. This saves me quite some time. If you want to learn more about Live Bookmarks, check out: Mozilla Firefox: RSS and Live Bookmarks. Firefox's Live Bookmarks showing headlines in a drop down menu. Another great feature of Firefox I really love is how it can be easily extended, and that a lot of people have taken this feature very serious and written great add-ons (extensions). This extension makes it very easy to add a URL with a description taken from the title or a selection of a web page to a wiki, a message board, etc. See Copy URL+ extension for Firefox for more information. Some web sites use in my opinion too much flash. Since I don't want to be bothered without asking with music, sound effects, and rapid animations, I have installed Flashblock in Firefox. See Flashblock. The It's All Text add-on allows me to edit text I enter in a form in my favorite editor. On Windows XP that's TextPad. This editor has great features which makes it easier to edit the text compared to what browsers offer. For example: search and replace, macro recording, sorting, etc. See: It's All Text! A highlighted link to my site on Ubuntu forums. The bookmarks toolbar is the toolbar just under the toolbar that has the location bar. As the name implies you can use it to access (some) bookmarks. I currently have added two folders to this bar, each acting as a drop down menu with bookmarks, see Firefox quick bookmarks. Besides those two folders, I have seven Live Bookmarks added to the bookmarks toolbar, each acting as a drop down menu to recent articles, showing the headlines. See Mozilla Firefox: RSS and Live Bookmarks for more information. I often post to web based forums, and since English is not my first language the built in inline spell checking in Firefox comes in handy often. One mayor annoyance I got rid of when I switched away from Internet Explorer 6 was sites opening pop-up windows unasked. Firefox nicely blocks those, and offers the option to whitelist sites in case I want to see those pop-up windows anyway. While in general I don't customize applications I use from day to day visually, Firefox is an exception. Maybe because it's so easy to do with Firefox. For example, I've removed the go button and the search bar. I've no need for either; the function of the former is identical to pressing Enter after entering an web address in the location bar, and the latter I've replaced with smart keywords. Also, I turned off the annoying "find in page" sound long ago. In the rare cases that Firefox crashes or if Windows XP reboots after an automatic update, I am extremely happy that the next time I start Firefox the browser asks if I want my tabs restored. What are your reasons for using Firefox? So now you know my reasons for using Firefox. What are yours? Use the comment option to post your list.